Good. 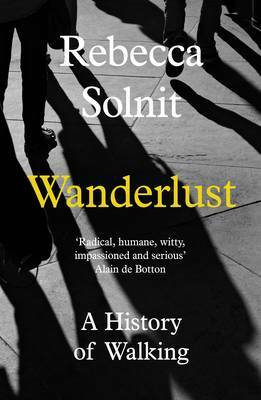 Wanderlust by Solnit, Rebecca. Fine. 336 p. In Stock. 100% Money Back Guarantee. Brand New, Perfect Condition, allow 4-14 business days for standard shipping. To Alaska, Hawaii, U.S. protectorate, P.O. box, and APO/FPO addresses allow 4-28 business days for Standard shipping. No expedited shipping. All orders placed with expedited shipping will be cancelled. Over 3, 000, 000 happy customers. Good. Fast Dispatch. Expedited UK Delivery Available. Excellent Customer Service. Previous owners annotations/highlighting. Fine. SHIP DAILY from NJ w/tracking; GIFT-ABLE AS NEAR NEW: FEELS UNREAD, FINE LATER PRINTING, NEAR FINE (subtle beginning spine crease) AS SHOWN THIS COVER. Trade paperback (UK). Glued binding. 326 p. Audience: General/trade.16811 16811--What does it mean to be out walking in the world, whether in a landscape or a metropolis, on a pilgrimage or a protest march? In this first general history of walking, Rebecca Solnit draws together many histories to create a range of possibilities for this most basic act. Arguing that walking as history means walking for pleasure and for political, aesthetic, and social meaning, Solnit homes in on the walkers whose everyday and extreme acts have shaped our culture, from the peripatetic philosophers of ancient Greece to the poets of the Romantic Age, from the perambulations of the Surrealists to the ascents of mountaineers. With profiles of some of the most significant walkers in history and fiction-from Wordsworth to Gary Snyder, from Rousseau to Argentina's Mother of the Plaza de Mayo, from Jane Austen's Elizabeth Bennet to Andre Breton's Nadja-Wanderlust offers a provocative and profound examination of the interplay between the body, the imagination, and the world around the walker. Fine. 100% Money Back Guarantee. Brand New, Perfect Condition. We offer expedited shipping to all US locations. Over 3, 000, 000 happy customers. Trade paperback (US). Glued binding. 326 p.